2 Pack Firestone 9000 Tapered Sleeve Air Bags for load support/ helper bags - direct replacement for firestone ride rite helper kits with tapper sleeve 9000 series 110/70 style bags. 1832 Lone Star Rd, Mansfield, TX 76063. Firestone F9000 110/70 1/4 NPT Tapered Sleeve. 2- Pack Brand New Firestone 9000 Taper sleeve air bag with 1/4 Single Port 110/70 Style. These are 1/4 NPT Single port. These bags can only be used on the rear suspension with light weight applications. These bags can only carry 1500 Lbs Max. These Bags can be used on any low rider truck or car with maximum weight not exceeding 2000 LBS. These are direct replacement for Firestone Ride Rite Helper Bag kits (Make sure the bag is 9000). Motor homes, RV's etc. Note: Please do not over extend this bag, if the bag will over extend means comes out of bottom plastic piston then these will collapse sideways causing rubbing. The usable maximum stroke is 8-8.5 depending upon bag brackets, bag mounts. For load leveling/ helper bags make sure that there is 3-4 clearance between frame and tires. Always use right type of bag mounts to get maximum benefit from these bags. Always use recommended torque for bolts as specified on bag. Port Size : 1/4 Female NPT (Single on top side). Minimum Height : 4.5 Collapsed. Free Standing Height: 7-7.5 Without Air. Maximum Load Capacity : 1500 LBS per Bag (Will Vary depending upon vehicle). Top Mounting Holes : 2.75 Center to Center (Blind) Do not use very long bolts as they will puncture the top plate, bags will leak. Bottom Hole : One (Blind hole) in Center with Brass Bushing 3/8-16 UNC, Do not use too long bolts as it will crack the bottom plastic seat. WARNING: This product can expose you to chemicals including lead, which is known to the State of California to cause cancer and birth defects or other reproductive harm. We are located at 1832 Lone Star Rd, Mansfield, TX 76063. We will answer your question or concern within 24 hours. International Customers (including Mexico & Canada) - Please Note. We cannot under-value merchandise or mark the items as a gift on custom forms & Invoices. This is against US and international laws. Please make sure, your address information is correct and up to date. All return items must be authorized and approved by us. Your feedback is very important for us. We will definitely resolve it. You can leave us a voice message, someone from our staff will get back to you same day or within 24 hours regarding the help and assistance needed. The item "2 Pack Firestone 9000 Taper Sleeve 110/70 Model Air Bags, Load Support, Air Ride" is in sale since Tuesday, May 31, 2011. 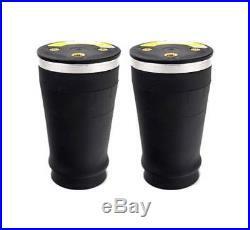 This item is in the category "eBay Motors\Parts & Accessories\Car & Truck Parts\Suspension & Steering\Lower Kits & Parts". The seller is "newmatics" and is located in Mansfield, Texas. This item can be shipped worldwide.